When you've got me in your corner, it's not a matter of could you do, but what couldn't you do?! I've got it all! 508® Natural Sunlight Illumination, a broad shade for maximum workspace lighting, a bonus magnifier and a pattern clip! Description A real multi-tasker. When you've got me in your corner, it's not a matter of could you do, but what couldn't you do?! I've got it all! 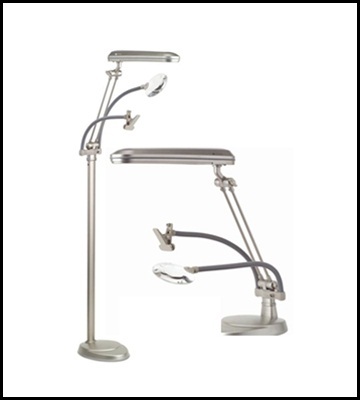 508® Natural Sunlight Illumination, a broad shade for maximum workspace lighting, a bonus magnifier and a pattern clip! I even convert from floor to table to clamp lamp!